Amigo Pancho 6 is the 6th part of this interesting puzzle series, developed by Qaibo Games. Welcome back to the exciting series Amigo Pancho. Afghanistan is the country of a famous international criminal. In this game, your mission is to help Pancho get through the obstacles along the way, fly to Afghanistan safely and catch the terrorist. The game has 25 levels, with each level being a challenge for you. When you start the level, your score will decrease. So you have to finish the level as fast as you can. The faster you complete the level, the higher your score will be. Amigo Pancho 6 has 25 levels, however, at some levels you will see yellow stars. Collect the yellow stars and you will have extra bonus. Also, you can change the skin for Pancho even if you are playing the game. Similar to previous versions, Pancho will continue to face many dangers. And you have to control Pancho wisely to help him fly to the sky with his balloons. Wind fans are your useful items. You have to use them to push the cactus and spike-balls away from Pancho. You also have to use the fan to adjust the direction of the balloons. There are other dangers awaiting Pancho on his way to Afghanistan. Good luck and have fun! Use mouse to remove objects and help Pancho fly to Afghanistan. 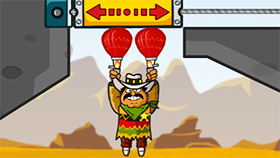 The cactus spikes cannot kill Pancho but can explode his balloons. Are you looking for a safe place to play Amigo Pancho 6 Unblocked? Take a look at Freegames66. Here, you have a friendly interface to play Amigo Pancho 6 Unblocked. Besides, Freegames66 has over 4000 unblocked games to help you entertain whenever you want. Now, enter Amigo Pancho 6 Unblocked, click to remove the objects and help Pancho fly to Afghanistan. Play now!